Herping for reptiles and amphibians including lizards, snakes, turtles, tortoises, frogs, toads, salamanders, newts and other interesting creatures in their natural Minnesotan habitat, with locations, pictures and commentary. Minnesota is the northern-most state in the U.S., complete with nasty winters, but it does actually have a healthy and diverse population of reptiles and amphibians. I grew up in Minnesota, and it's a great state. A couple friends of mine, Mark Hamernick (who eventually was hired by the state to study the Blanding's Turtle) and Chad McClish, got me hooked on reptiles and amphibians when I was in the second grade—it's been a passion of mine ever since. When we weren't playing smear-the-queer or throwing Marino-bombs during recess, we were flipping logs and boards looking for herps. On weekends, we'd get together and search for snakes, lizards, turtles, (no tortoises), frogs, toads, salamanders, newts, you name it. I was fortunate enough to live directly behind a large pond (it was about 15 feet from our pool), there were two even bigger ponds within 150 yards, a fairly thick woods, plenty of prairie land, and even a lake (Karth's Lake) within walking distance. Here's a quick summary of an average herping day for us: After spending a few hours walking through the woods, wading into ponds, walking the prairie, and checking the lake, we'd usually have found several Plains Garter snakes (Thamnophis radix), maybe a Red-bellied snake (Storeria occipitomaculata), Painted turtles (Chrysemys picta), Leopard frogs (Rana pipiens), Spring Peepers (Pseudacris crucifer), and Cope's Gray treefrogs (Hyla chrysoscelis). We had to get a little farther out of town to find what we considered the crown jewel: Five-lined skinks (Eumeces fasciatus). Once in a while we'd catch something we had never seen before, and it was always fun to rifle through our trusty Audobon Society Field Guide to North American Reptiles and Amphibians to find out what it was, and read about it. Chad moved to Florida after third grade, but Mark Hamernick and I continued herping regularly. 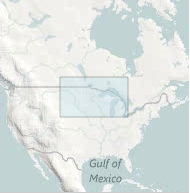 As mentioned above, Mark did a couple substantial studies on Blanding's turtles (Emydoidea blandingii) for the state in the late 90's, even utilizing radio telemetry, (here's a link to one of them). He eventually taught me how to spot where turtles had nested, and I actually got pretty good at it (to this day I can spot one immediately). I would dig up nests every so often and hatch the Painted turtles in my Hova-bator incubator. They always hatched—all of them—and that always amazed me. Mark and I lost touch touch after 2003—so Mark, if you're reading this, send me an e-mail so we can catch-up buddy. My good friend Mark Hamernick would pick up anything, and I mean anything. I never quite understood it. He would grab first, and think later, but I don't ever recall it backfiring on him too badly. Plains Garter snakes (Thamnophis radix) love to bite, we both learned that quite regularly, and it often drew blood. I don't ever remember finding an Easter Garter snake (Thamnophis sirtalis), but it's possible that we did. Garter snakes were usually the only reptiles that frequently bit us, other than skinks, which also seemed to have a proclivity towards using their jaws to send a message. One fine Minnesota Summer day, Mark and I were walking through the large backyard of a nearby home, a yard that backed right up to a very large pond. They had a garden, and around that garden they had logs split in half (flat-side down) forming a border. Well, being nine or ten years old, we couldn't resist flipping each of the rotting logs over to see what reptile or amphibian treasures may lie beneath. A docile red-bellied snake (Storeeria occipitomaculata) perhaps? Maybe a striking Tiger Salamander (Ambystoma tigrinum) or Blue-spotted salamander (Ambystoma laterale)? Here's what we found: once we turned the half-log over, the most gargantuan Plains Garter snake (Thamnophis radix) we'd ever seen erupted from its slumber. It began slithering away at a brisk pace, and I courageously yelled to Mark, "Grab it!" He responded with, "I'm not grabbin' that thing!" I said, "Come on!" in my most "you're a wimp" tone and and he retorted, "No way!" We watched, literally awestruck, as it disappeared into the tall green brush. It was the first, and only time, I ever saw Mark hesitate. Supposedly, Plains Garter snakes (Thamnophis radix) can attain a maximum length of 40 to 43 inches, but based solely on my experience catching hundreds in Minnesota, they are more commonly found in the 20 to 30 inch range. Eastern Garter snakes (Thamnophis sirtalis) have a slightly longer maximum length of approximately 48 inches, but we rarely (if ever) saw that species—they have red speckling on their back, and I feel like I would've remembered or noticed that much of a physical differentiation. The beast snake that Mark and I came across was ungodly in size; a mutant if you will. Never before, or since, have I seen any Garter snake that enormous. I've googled "giant Garter snake," "huge Garter snake," "record Garter snake," and have yet to see anything nearly as show-stopping as the Garter snake we unearthed. I would estimate the giant Garter snake was 50 to 55 inches, with a girth diameter of 2 to 2.25 inches. Think about it—this Garter snake was so large that two very experienced herpers, who had caught literally hundreds of Garter snakes by hand, would not even think about stepping on its tail to pin it down, much less grab it with our hand. It was that huge. Forget about fright-induced hyperbole—it was unholy, it was mind-boggling. 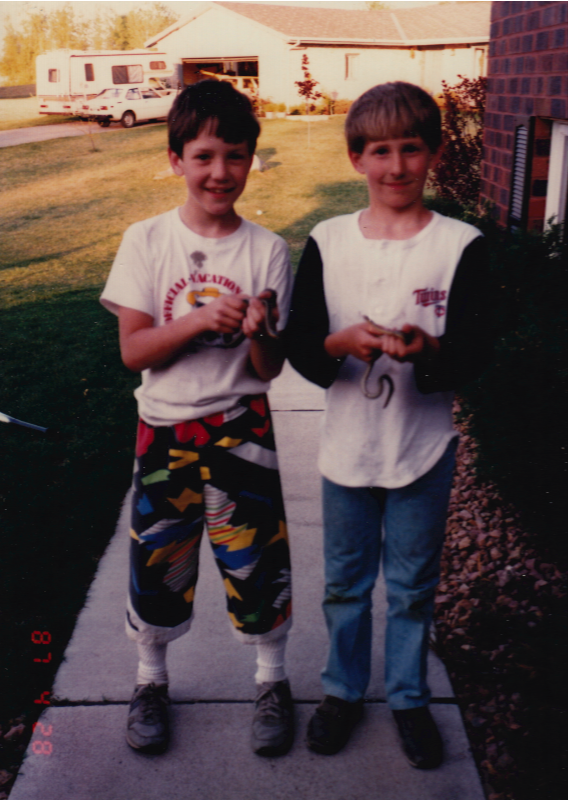 Here's a picture of Mark and I (Sam) on April 28th, 1987 after a day of herping—we're holding Garter snakes. While I was in college, I worked part-time at a golf course near my house. It was a great time—free golf, free soda, free driving range—plus we got to tool around on the golf carts in the evening after management left. I had been wanting to catch a big snapping turtle for a while, and despite the fact that they're common in Minnesota lakes, ponds, and rivers, it's very rare to see them on land unless they're going to lay eggs. One evening, for some reason, I decided I would drive to the golf course to see if I could find one on its way to lay eggs. There were several ponds on the recently constructed course, so my odds could've been worse. It was about 10pm, so I grabbed a flashlight, and headed to the course. 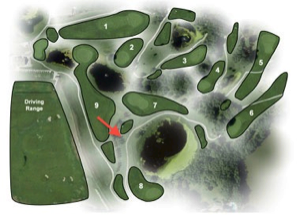 Once I got there, I started walking across the 9th fairway, closest to the clubhouse, and suddenly my flashlight beam caught something in the darkness. I remember skeptically thinking, "No way. There's no way it was this easy." As the distance between myself and the object shrank, so did my skepticism. I was elated. In fewer than two minutes, I was standing over a really large common snapping turtle. What were the odds? I could've counted on one hand how many snapping turtles I had caught up until that moment, and here on this night, purposing to find one, I do so within minutes. Here's a story about another colossal reptile I witnessed. I was on our family's bucolic property up in South Haven, Minnesota. The property itself was situated on a string of three lakes, lakes that were fed by a river, so there were always plenty of Spiny Softshell turtles, Painted turtles, Snapping turtles, and even a few Blanding's turtles. 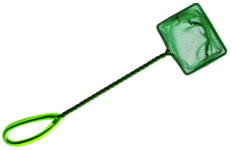 One warm Summer weekend, I was walking near the shoreline when something caught my eye—something sticking out of the water about 20 yards away, and moving. Honestly, it looked like some sort of imaginary sea serpent. I stared some more. It had a very long neck, a pointed head, and a massive body behind it. The head very much resembled a submarine periscope. Eventually, I realized that it was a giant Spiny Softshell turtle (Apalone spinifera). It was hard for me to believe how immense the turtle was, so I just kept watching. It patrolled the water parallel to me for a distance of about 40 yards, and then disappeared into the depths of the lake. Now, if you read-up on Spiny Softshell turtles, you'll find that they are believed to attain a maximum carapace length of between 17 and 19 inches. I was 20 or so yards away from the turtle, so I obviously cannot be sure, but I believe based on the visible carapace as well as the length of its neck and size of its head, that the total carapace length was approximately 20 inches. Again, never before, or since, have I seen a Spiny Softshell turtle nearly as large. It was a monstrous turtle. Witnessing a reptilian beast of such size left an indelible mark on me. 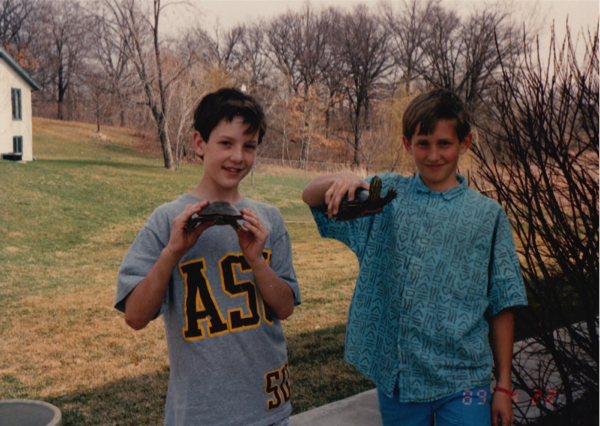 Here's another picture of Mark and I on April 22nd, 1989 after a day of herping—we're holding Painted turtles.